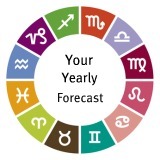 Future predictions... you can use your personal astrological cycles to create a postive impact in your life. Most people express an interest in astrology for a variety of reasons. Beyond looking at Sun signs, a personality profile or horoscope is usually one of the first areas in which people want to understand more about the techniques and traditions of astrology and how it works for them. The next question to ask is how is astrology impacting my day-to-day life now and into the future. The study of the birth-chart, in this respect, is a fascinating aspect of astrology. Two very different astrological methods may be applied to the birth chart. Each in it's own unique way establishes an awareness of future trends and cycles in your life. Future Predictions - the planets are changing their placement in relation to each and everyone of us. These movements are called transits and they are the first of two fundamental tools that may be used to anticipate trends. Transits are life cycles that correspond with the movement of planets in relation to the position of the planets at your birth. Transits are the positions of the planets through the signs of the zodiac at any given time after you are born. These transits can then be interpreted in relation to the birth-chart of each of us. Think of it as a personal GPS - a complete personal navigational tool helping to guide and provide insight into your changing landscape. This is a map for your Journey through life. Progressions are a second method used for timing events or predicting future trends in your life. They are based on the motions of the Earth and the other planets in the days following birth. An Annual Power Tool To Plan Your Future With..
Why are Solar Returns significant? What happens and what can happen, and why? A Solar Return chart is simply a chart calculated for the exact moment when the Sun returns to its position at the time of your birth. The effects are felt for one year following this moment. In essence, Solar Return interpretations can begin to apply about three months before your birthday, last through the year and usually fade by the time of your following birthday. Three months to the day before your birthday is usually a significant time frame and can mark a time of important transitions for you. This is an opportunity to understand how astrology and the changing movement of the planets impact your personal predictions of the future just for for you. It is a guide that enables you to take control and start taking your life where you want it to go. Each of these methods may be used to construct a unique type of astrological forecast for an you. A view of times and trends to come. These trends may help to indicate when life is going to go smoothly for you and when difficulties may arise in certain areas. Metaphorically, if you know it is going to rain you can take an umbrella. If you know it is going to be a beautiful day you can plan to embrace it and take advantage of every opportunity made available to you . If we know when to buckle down and when to soar we can plan accordingly. Future prediction astrology tools - in astrological terms are known as transits or progressions. In every-day-language they are used to gain information about your health, career, family and finances. If used properly, astrology can indicate where opportunities may occur and help you to make the best of yourself, your potential and your life.